Rangers gain a +2 class bonus to Dexterity or Strength, as long as it isn’t the same ability you increase with your +2 racial bonus. Possible backgrounds include: trackers, bounty hunters, beast slayers, woodsy assassins, orc slayers, and wanderers. 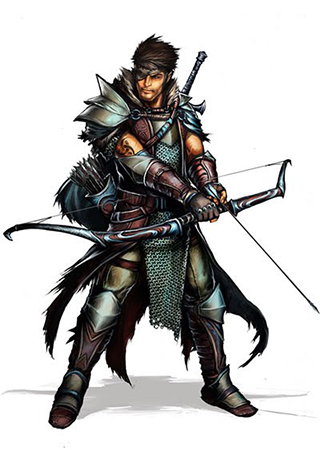 At 1st level, a ranger starts with light armor, a melee weapon or two, a ranged weapon or two, and other mundane gear as suggested by their backgrounds. Rangers may start with either 25 gp or 1d6 x 10 gp. You get an additional ranger class talent at 5th level, and again at 8th level. Special: Unlike most class talents, this talent takes up two ranger class talent slots. You have a normal-sized animal companion that fights alongside you in battle. See Animal Companion Rules. If you would rather have a smaller beast as a pet, see the Ranger’s Pet talent. Once per battle, reroll one of your missed ranged attacks. Adventurer Feat Your Archery rerolls gain a +2 attack bonus and the attack’s crit range expands by 1. Champion Feat Once per day, you can use Archery twice in the same battle. Epic Feat Once per day, you can turn a normal hit with a ranger ranged attack into a critical hit. When fighting with two one-handed melee weapons, your default option is to make a double melee attack. Your weapon damage die drops one notch, usually from d8s to d6s. If your first attack is a natural even roll (hit or miss), you can make a second attack as a free action. If you decide you don’t want to try for a double melee attack while fighting with two one-handed weapons, declare it before rolling your attack; the single attack will deal the normal damage dice instead of using reduced damage dice. Adventurer Feat Your second attack gains a +2 attack bonus if it is against a different target. Champion Feat Once per battle, use Double Melee Attack after an odd attack roll. Epic Feat Each turn, you can pop free of one enemy before one attack roll that is part of a Double Melee Attack. You can also use your move action in between your two attacks if you wish. When you attack with a ranged weapon that does not need to be reloaded, your default option is to make a double ranged attack. If you decide you don’t want to try for a double ranged attack when firing your bow or other ranged weapon, declare it before rolling your attack; the single attack will deal the normal damage dice instead of using reduced damage dice. Champion Feat Once per battle, you can use Double Ranged Attack after an odd attack roll. Epic Feat Each turn, you can pop free of one enemy before one attack roll that is part of a Double Ranged Attack. You can also use your move action in between your two attacks if you wish. Choose a specific monster type (e.g. aberration, beast, construct, demon, dragon, giant, humanoid*, ooze, plant, or undead). The crit range of your ranger attacks against that type of enemy expands by 2. *Choosing humanoid: Unlike other favored enemies, choosing humanoid as your favored enemy takes up two ranger class talent slots. Adventurer Feat You can change your favored enemy by meditating when you take a full heal-up. Champion Feat Your crit range for attacks against favored enemies expands by 1 (to +3). Epic Feat Choose a second non-humanoid monster type as a favored enemy. Choose one daily or recharge spell of your level or lower from the sorcerer class. You can cast this spell as if you were a sorcerer (though you can’t gather power). Adventurer Feat You can choose which ability score you want to use as the attack ability for sorcerer spells you can cast. Champion Feat You can now choose from sorcerer at-will spells. Epic Feat You gain an additional sorcerer spell of your choice that is your level or lower; a total of two from this talent. The first time you attack an enemy during a battle, your crit range for that attack expands by 2 (usually to 18+). A mob of mooks counts as a single enemy. Adventurer Feat The crit range of your First Strike attacks expands by 1 (to +3). Champion Feat Once per day, deal triple damage with a First Strike crit instead of double damage. Epic Feat Whenever you hit with a First Strike attack, you can reroll your damage once and use the higher roll. Once per battle as a free action, choose an enemy. The crit range of your attacks against that enemy expands by 2 for the rest of the battle. A mob of mooks counts as a single enemy. Adventurer Feat The crit range of your Lethal Hunter attacks expands by 1 (to +3). Champion Feat One battle per day, you can use Lethal Hunter against two different enemies. Epic Feat Your Lethal Hunter crits deal triple damage instead of double damage while the escalation die is 3+. Choose one daily or recharge spell of your level or lower from the cleric class. You can cast this spell as if you were a cleric. You can change your chosen spell each time you take a full heal-up. Adventurer Feat You can cast the cleric class feature heal spell once per battle. Champion Feat You can now choose from cleric at-will spells. Epic Feat You gain an additional cleric spell of your choice that is your level or lower; a total of two from this talent. The creature is your pet or friend instead of your familiar. Your pet is fully natural rather than partially magical. Your pet can end up with more abilities, if you choose. Adventurer Feat Your pet gains a third ability. Champion Feat Your pet gains a fourth ability. Epic Feat Your pet gains a fifth ability. You have the Tracker background at its full possible bonus of +5, without having to spend your normal background points on it. You are an expert wilderness tracker, capable of reading clues from the environment that others can’t perceive. Tracking doesn’t work well, however, in heavily traveled urban environments. In addition, you have the terrain stunt power. Terrain stunt: At the start of each battle in a non-urban environment, roll a d6. Any time after the escalation die reaches that number, you’ll be able to use a quick action to execute a terrain stunt. Normally you can only use terrain stunt once per battle, but circumstances, geography, or excellent planning may suggest that you can pull it off more than once. Terrain stunts are improvisational effects that play off your preternatural understanding of the wilderness and all the diverse forms of the natural world. Things like knocking a hornets nest no one had noticed onto your enemy’s head, maneuvering a foe onto a soggy patch of ground that slows them down, shooting the cap off a mushroom spore in a dungeon that erupts on your enemies, getting your enemy’s sword wedged into a stalactite, finding the tree branch that lets you vault up to attack the flying demon that thought it was out of axe range, and similar types of actions. Adventurer Feat Your grasp of the way the world is put together increases; you now can use terrain stunt in urban environments. Champion Feat You can track as well in urban areas as you do in the wilderness. Epic Feat You can track flying creatures and creatures that normally wouldn’t be trackable, and there’s the possibility that even teleports give you a sense of direction. You gain a +1 attack bonus when fighting with a one-handed melee weapon in each hand. Adventurer Feat When you fight with two one-handed melee weapons, increase the damage you deal with missed attacks by adding your level to it. Most of your basic melee attacks, therefore, will deal double your level as miss damage. Champion Feat If you fight with two one-handed melee weapons, whenever an enemy makes a melee attack against you and rolls a natural 1, you can make an opportunity attack against that foe as a free action. Epic Feat One battle per day, increase the damage you deal with missed attacks to triple your level instead of double your level (from Two-Weapon Mastery). You have a devoted animal companion who fights alongside you like a member of your adventuring party. Add two recoveries to your total recoveries. You can use a recovery on yourself or your animal companion. Your animal companion acts on your initiative turn, either immediately before or after you, depending on the animal type. Your animal companion moves gets a move action and a standard action, but not a quick action. If you have powers that care about the ‘first time you attack an enemy,’ an attack by your animal companion counts as your attack. Your animal companion can be healed like an ally. If it gets healed without you being healed, it uses one of your recoveries. When you use a recovery while next to your animal companion (including being engaged with the same enemy), your animal companion is also healed using a free recovery. Instead of dying like a monster or NPC at 0 hp, your animal companion follows PC rules for falling unconscious at 0 hp and dying after four failed death saves or when its negative hit points equal half its normal hit points. If your animal companion dies, you can summon another one. If you’re still on the same adventure, you can call a new animal companion the next day, but it will be one level lower than an animal companion would normally be. At the start of a new adventure, or when you gain a level, bump the companion up to its proper level. Each animal companion has roughly the same base stats as listed below. Your animal companion is always one level lower than you. As a 1st level ranger, you’ll have a level 0 animal companion. Once you gain a level, your animal companion rises to 1st level. On top of the base stats, each type of animal has a zoologically appropriate power or advantage. Each type of animal companion is a little different. Advantage: The bear gains temporary hit points equal to its level each time it hits with an attack. Champion Feat The temporary hit points increase to double its level. Advantage: The boar gains a +1 attack bonus when it moves before its attack during the same turn. Advantage: It flies! Its melee damage die is dropped by one size (d6 at level 0). Advantage: The panther’s crit range expands by 2 against enemies with lower initiative. Advantage: The snake also deals ongoing poison damage equal to twice your level on a natural attack roll of 18+. Champion Feat The ongoing damage is three times your level instead. Epic Feat The ongoing damage is four times your level instead. Advantage: The wolf gains a +1 attack bonus against enemies its master attacked the same turn, or against enemies engaged with its master. Use the following stats as the baseline for your animal companion. Remember that your companion stays a level lower than you. Generally your companion’s Physical Defense should be higher than its Mental Defense, but you could flip that if you have a good explanation. Ranger animal companion feats are designed so that they do not build on each other. Unlike other feats, you don’t have to take animal companion feats progressively, one after the other as long as you qualify for the correct tier. Adventurer Feat Once per day, your animal companion can attack twice in a round with a standard action. Adventurer Feat Once per battle, your animal companion can turn a disengage success by an enemy it is engaged with into a failure. Adventurer Feat Once per day, reroll one of your animal companion’s missed attack rolls. Adventurer Feat Your animal companion adds the escalation die to its attacks. Champion Feat Once per day, your animal companion can force an enemy to reroll an attack that hit it. Champion Feat Your Lethal Hunter talent also applies to your animal companion. Champion Feat Increase your animal companion’s Physical Defense and Mental Defense by +1. Epic Feat Increase your animal companion’s AC by +1.